I would just like to share something I was able to find in my recent photo archives – a photo of my Vanilla Rooibos full-leaf tea latte from Starbucks. I remember feeling a lazy that night to make my own tea latte and so I decided to buy one of their new tea latte concoctions. Rooibos, pronounced as “roy-bos” is Afrikaans for “red bush” (thanks to Wikipedia). And this plant has South Africa as its origins. The Vanilla Rooibos is basically that with an infusion of vanilla. 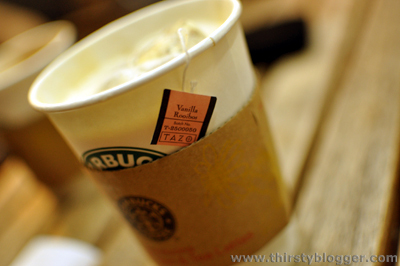 And drinking one, specially as a tea-latte, will give you an interesting and flavorful experience – a bitter-sweet and tangy vanilla cream palate. So if you’re tired of drinking black tea and green tea, then try some red tea and order the Vanilla Rooibos full leaf tea. Nice article. Thanks for inspiring me to try something new.